Maximum Harddrive size for Storage Spaces? 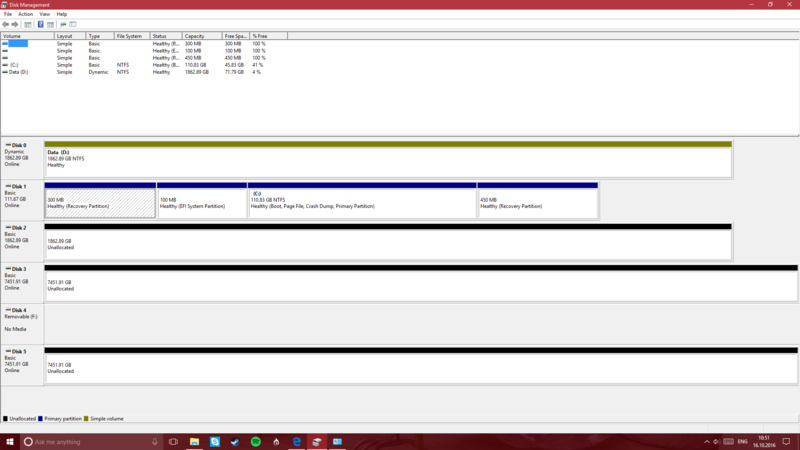 I'm attempting to set up a software RAID1 of 2*8TB drives and after encountering the incredibly slow syncing of Windows' mirroring system (both drives are empty) in disk management I looked around and found Storage Spaces. They seem great, especially when combined with ReFS for data security, however my attempts are failing at creating the storage space with the 8TB drives. 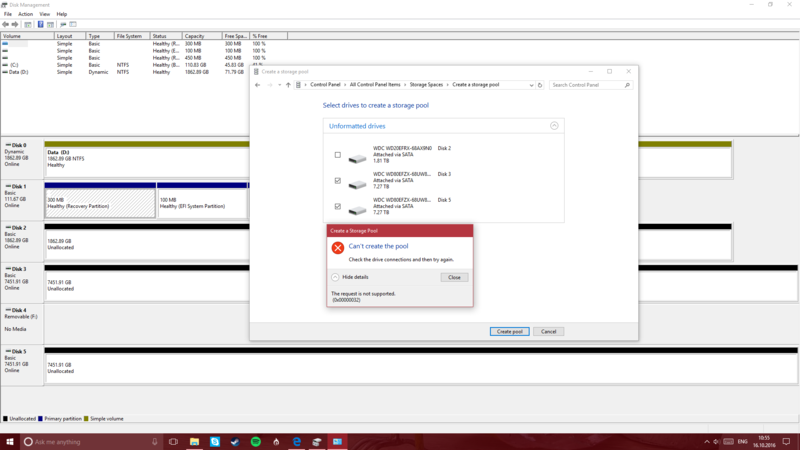 My 2TB drive works fine but I can not add my 8TB drives. Attached some images that might be of help. Hope someone can point me in the right direction, can't find any information as to why this shouldn't work. So after playing around with VHDs and finding out it works perfectly fine with 2*8TB VHDs, I proceeded to add my two physical 8TB drives to the storage space containing the 2 VHDs and that worked. After I decided to try my luck and after removing the VHDs and the storage space tried only my two 8TB WD HDDs and lo and behold, it worked without a problem. Thanks for the help guys but it seems it just fixed itself somehow. Not the answer you're looking for? Browse other questions tagged windows hard-drive windows-10 raid storage-spaces or ask your own question. Using storage spaces like raid 0 + mirroring? Calculate usable storage space with different size drives in Windows Storage Spaces?